What are Pro-Gun Parents Afraid Of? A group of parents hired an attorney as a front person so they could remain anonymous. What a great idea! With a lawyer as your “mouthpiece” the parents can hide their political connections and financial backing. If nobody knows who they are, they can avoid personal and/or professional shunning. I totally understand why the parents wanted to remain anonymous. Some of their fears of consequences are valid, others are projections of their fear that the left will attack people just like the right. I’ve seen the NRA facilitate a national attack. Slaughter lobby supporters went after gun-control advocates by doxxing them and then carrying out legal, professional, financial and physical threats. Below is from the comments section at Breitbart. Notice how they assume that the left will attack them and how they will attack. Yes. I accept that the left would insult the pro-gun parents. They will get their questions about their motives. Some maybe vitriolic comments. But violence, slashing tires, vandalizing homes and death threats? Really? Whose behavior does that actually sound like? They know we aren’t going to do that. What they are afraid of is our effective use of a myriad of polite society tools. Ask them if they carry concealed weapons when they are out of their homes. Do they carry concealed guns while carpooling? Do they have enough liability insurance in the event of a gun accident to cover medical bills pain and suffering? They are also afraid that we will a) enforce the laws already on the books regarding guns and b) change the laws on the books and c) take their guns. These are fears they SHOULD have. The more effective and aggressive we are the more the gun lobby and their supporters will ramp up the intimidation. We need to be prepared. I was recently discussing the problem with armed protesters outside of a school. I was explaining the various different actions parents in a school district could use to stop the armed protests. It made the women I was talking very nervous. She didn’t want to be in the cross hairs of a gun nut. I don’t blame her. Then it hit me. Our side needs to get attorneys so we can remain anonymous! Bingo! Eureka! Now I just need to find some attorneys! 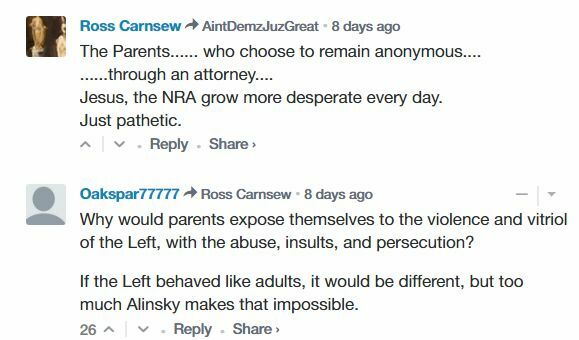 2 comments to What are Pro-Gun Parents Afraid Of?